The promos of Aagey Se Right have been misleading to say the least. While it has been projected as a Shreyas Talpade-starrer, Kay Kay Menon has an equally important role. Not that it really leads one to cheer. Reason being that what seemed like an innocent tale of a newly recruited cop (Shreyas) hunting for his gun takes an altogether different dimension with a terrorist (Kay Kay Menon) from border ke uss paar coming into picture. He gets all moony-eyed for a bar girl Shenaz Treasury (who has dropped 'vaala' from her surname). He begins with his sher-o-shaayari only to turn into a full-on tapori. From here on the film becomes an assortment of a series of coaching classes where a South Indian don Vijay Maurya, who operates as an entrepreneur with the promise of 'customer delight' and 'satisfaction guaranteed', teaches some tricks of the 'love trade' to Kay Kay. Yes, there are quite a few scenes that invokes chuckles and even full-throated laughter as Kay Kay goes through a heart transformation. His dialogues are witty while Vijay Maurya is a riot. In fact it's the latter's presence that keeps the momentum despite a wayward tale that debutant director Indrajit chooses to tell. One understands Indrajit's intent though -- which is to tell a story that is whacky, quirky, utterly unbelievable and on-your-face nonsense. Aagey Se Right aspires to be right in all these departments. It's just that the direction is all over in the second half of the film and the momentum that had built up in the first half doesn't remain as the film progresses. Change in heart for the terrorist, his accomplice flying into the country in search of him, a mother (Bharti Achrekar) who is always there to give direction to the novice cop, a bunch of DJs who play mischief mongers - there are too many characters and incidents that spoil the show. In fact, the entire track revolving around a struggling actor (Shiv Pandit) and his girlfriend (Shruti Seth) was completely unwarranted. One also wonders what made Mahie Gill sign this film. As a gossip news channel reporter, she makes an appearance every now and then in a thankless role. On the other hand, Shreyas is good but hardly has a role that can be compared to many of his earlier superior performances. Indrajit's direction becomes a little patchy, especially in the scenes that require multiple actors in one frame. So whether it is the shooting of a Bhojpuri film or a stampede that follows in Vijay Maurya's den or the suicide attempt by Shruti - there is an all around amateurism that is more than just apparent. However, in scenes that have only two actors interacting (Shreyas and his mother, Kay Kay and Vijay Maurya), he manages to get it right most of the time. 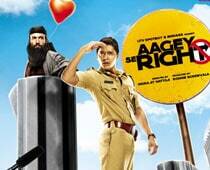 Aagey Se Right starts off as a sweet fun film but becomes tiring once it loses focus.